Ever since I bought my Hobonichi Weeks I’ve wanted to get rid of my purse. This post contains affiliate links, they will be marked with a *. I really liked my Cadenta Notebooks cover* and it gave me the inspiration to try and find a solution to put my Weeks and my purse together. 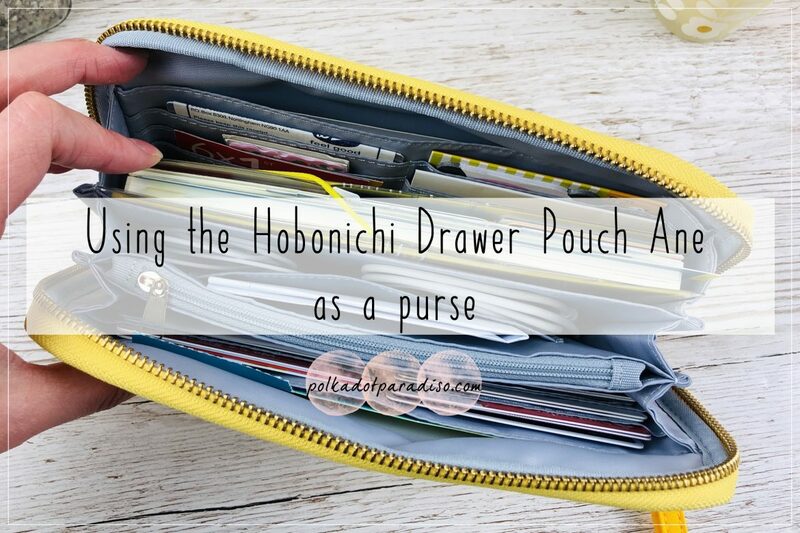 If you’ve read my Hobonichi Weeks Covers Comparison post you’ll know this year Hobonichi released the Ane Drawer Pouch and I instantly bought one to use as a cover/purse. I really wanted a cover that my Weeks would stay closed in. All the covers like the Cadenta one above had the Weeks swinging open every time I opened the cover and I hated that. I loved that I could just pop the Weeks in the Ane and just use it basically as a regular purse. I guess the first thing I should say is it’s not the most attractive as a purse. These pouches sold out pretty quickly so it was down to this, black and the Liberty fabric* one – they were only ones left that I liked. I wasn’t willing to stump up the cash for the Liberty one. Particularly as this was a new experiment and I didn’t even know if I’d like this set up. This pouch is the most pocket filled thing I’ve ever seen. Even now, after a few months of use I still haven’t used all the pockets. The exterior pocket that you can see above usually has business cards in. If you were to use this as a clutch purse (which the strap allows you to) my iPhone X fits in there, but is a little snug. Opening it up, you might assume it’s symmetrical inside. While at first glance it looks it, it actually isn’t and this makes it perfect for Weeks storage. Inside you get a large pocket on either side with six card pockets in front of each larger pocket. There’s also room in front of each card area for storage. There’s then a zip compartment and a large pocket next to it that goes the whole width of the pouch. Inside that there are two smaller pockets. So how am I using this as a purse? Firstly I kind of divided it into two, and this is where it not being symmetrical comes in handy. In one side, I have my usual purse things. In the large pocket at the back I keep vouchers and coupons. In the card slots I keep (you guessed it) all my cards. The small space in front of that is where I keep any receipts. In the zip pocket you may expect me to say I put cash in there but I stopped carrying cash at the end of year. Instead this is the perfect place for keeping pens and I keep two Pilot Coletos in there. In the other side is my planner section. The large back pocket has post it notes in, as do many of the card slots. There’s also things like stamps, more business cards and a gift card. The area in front of these card slots is a lot deeper than on the other side, so this was the more natural location to keep the Weeks. It fits perfectly, even with a Cover on Cover on. The Weeks would also fit in the large wide compartment in the middle but instead I keep my headphones and a spare Apple charging cable in here. I don’t like going anywhere without having a spare cable. You can see some paper in one of the little pockets in that compartment and that’s generally what those pockets are used for. Random bits of paper that don’t really fit in anywhere else. As you can see, this pouch* fits so much in. This isn’t even full yet really, and I could definitely put more in if I wanted to. Because of the accordion nature of it, it always zips up nicely and never looks too thick or bulgy. I’m really happy with this set up. It’s everything I wanted. If only Hobonichi restocked some of the nicer, more purse-like designs I would purchase immediately. The only thing I would say about this pouch is it’s pretty large. It’s about 3-4cm wider/taller than the Weeks and so I found I had to purchase a new handbag large enough for it (not that a new handbag is ever really a bad thing). Do you use a planner cover as a purse? I’d love to see your set ups!